Progressive Endurance recently had 4 athletes race 70.3 Chattanooga. All 4 did really well and I’m proud of all them. 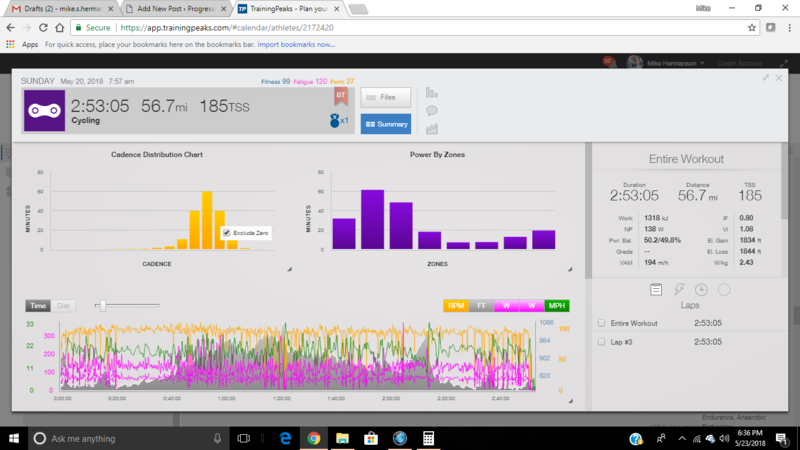 I wanted to take a few minutes to break down what I look at when an athlete is getting ready to race and a breakdown of their bike power files to highlight what they did well and where improvements could be made so you can race smarter too. 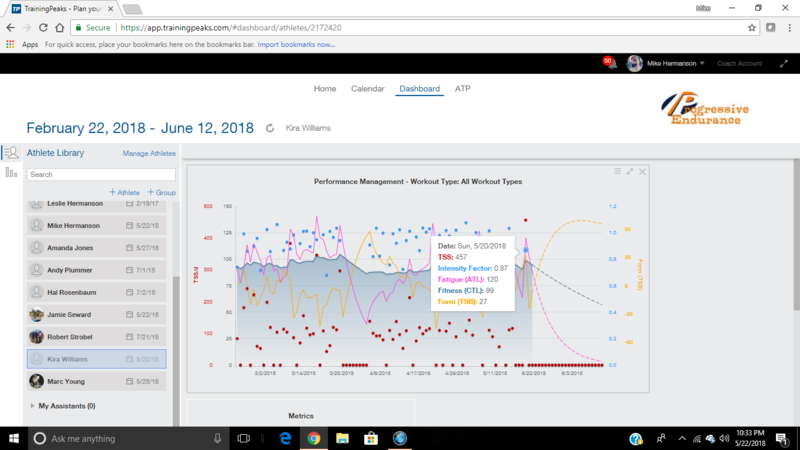 The PMC is, in my opinion, a very powerful tool to use within TrainingPeaks to make sure an athlete is preparing, tapering, and peaking well for a race. In order for the PMC to be accurate, you MUST have all thresholds set correctly for swimming, biking, and running. You also can’t use TSS derived from power for biking in some workouts and HR from others to be accurate. In almost, if not all cases, TSS derived from HR will be higher than TSS derived from power for the same workout. This applies to other disciplines. In short, be consistent in how TSS is derived. If your thresholds are set up correctly, TSS is automatically calculated for each workout. PMC is only available on the paid version or coach’s version of TrainingPeaks. TSS – Training Stress Score – this is basically how physically demanding a workout was for an athlete. It is specific to the athlete based on the threshold settings for that discipline. CTL – Chronic Training Load. This is basically your fitness. It goes up slowly with consistent training as long as enough TSS being produced. At some point, if TSS isn’t increased, CTL will plateau. CTL is calculated from the previous 3 weeks of training. ATL – Acute Training Load – This is your fatigue. This flacuates a lot more than CTL since it ATL is calculated from the last 7 days of training. ATL is also calculated from TSS. 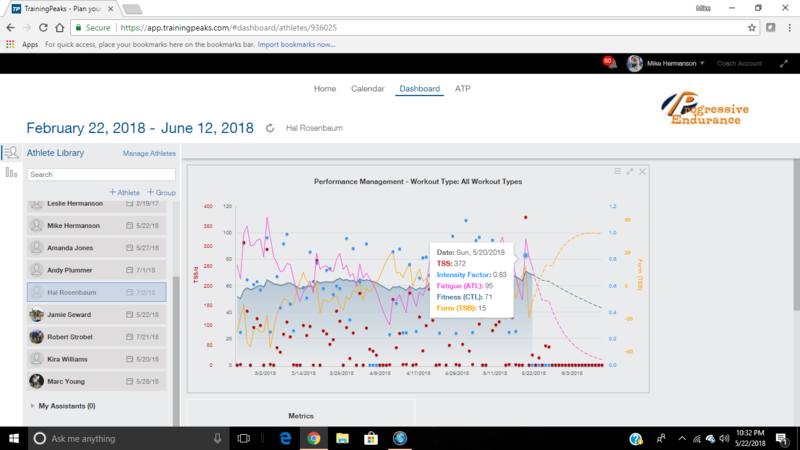 If you are just starting out on TrainingPeaks, you need about 3 months of data for the PMC to be accurate. As you can see, Kira had a pretty good build up to the race. There was time around the end of March where her CTL dropped due to being sick. After that it was an upward trend til her race with a drop during the taper. On race day her TSB was +27. This is right within the range she needed be to race well. Before we get started, here are a few terms I’ll be mentioning over the rest of this blog. It is important that you understand them. The first thing I look at after an athlete races is their TSS. The goal TSS for a 70.3 bike leg is 170-190. As you can see, Kira landed right within range for the bike leg. If the TSS is within range, typically everything else was done correctly too. 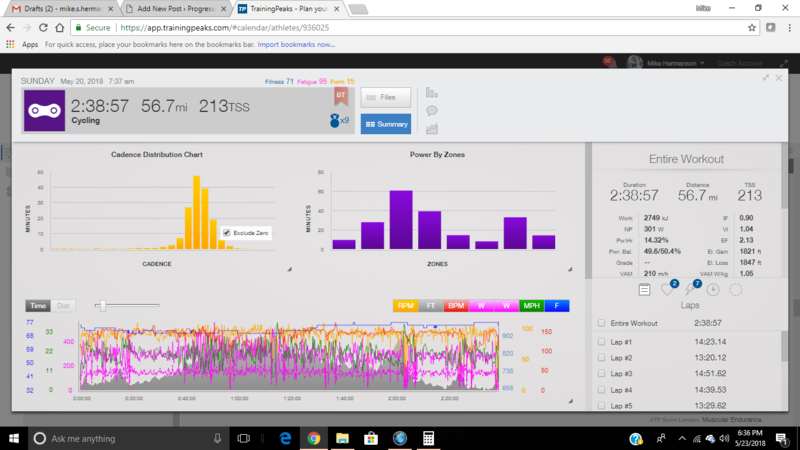 I estimated her bike speed to be about 19.5 mph and we dialed in her goal wattage to be 135-140w during some race sims leading up to the race. If an athlete has too much TSS on the bike, their run will almost always suffer. If their TSS is too low on the bike, they have saved too much energy for the run and went a little too slow on the bike. The next thing I look at is the average power and normalized power. The average power was 128w. Her normalized power was 138w. Only a 10 watt difference between them is pretty good. The variability index was 1.08. Anything under 1.05 is considered good for racing a triathlon. She has a little room for improvement, but honestly, her margin of error is much smaller compared to someone trying to push a higher wattage simply because 10 watts at 140ish watts is a bigger percentage than 10 watts at 250w. The next thing I look at is the cadence. Average cadence for Kira was 96 RPM. I also look at the amount of time spent at various cadences in increments of 5. This is important because not all watts are created equally. Kira spent about 85% of her time between 90 and 105 RPM (after removing zeros). This is very good! You can see he had a similar trend as Kira. He took a light week in the beginning of April due to a spring break trip with the family and then had a steady build, with recovery weeks built in, up to his taper for the race. His TSB was 15. In hindsight, I could have given him just a slightly different taper to get that number a little higher, but it is still within range. I looked at Hal’s power file in the same manner as I did Kira’s power file. I’ll highlight the same stuff below. Hal’s TSS was a little too high. We had practiced 270-280 watts for his race simulations since those numbers would have placed him within the 170-190 TSS range most likely. He rode about 20 watts to hard, which is why his TSS was over the suggested range. His average power was 289w and his normalized power was 301w. A difference of only 11 watts is pretty good. This made his VI 1.04. Just under the 1.05 target to be considered “good.” So Hal rode very efficiently, but just a little too hard. His average cadence was 92 RPM with 67% of his time spent between 90 and 105 RPM. He also spent about 20% of his time between 80 and 90 RPM. We have been working on getting his cadence up a little since I started working with him this year and he has made some great strides there, but still a little room for improvement. Hal struggled a little bit on the run toward the end due to the heat and hills on the his course, but I suspect that the TSS and a good amount of time spent in the 80-90 RPM range didn’t help matters. He also spent 32 minutes above threshold during the ride, including a 10 minute stretch with an average power just a little over threshold on one long, sustained climb. In the end, Hal still had a PR at the 70.3 distance on a difficult course. I’m still very proud of his accomplishments and extremely happy that his power meter captured this data so we both know what to fix in the future. This is why I highly encourage all my athletes to purchase one. In the end, it makes them more likely to achieve their goals because it allows me to help them better by seeing objective numbers.